See it brighter and clearer… with Artograph light boxes for every use and price range. The LightPad® LX Series is our classic aluminum-framed LED light box now MADE IN THE USA. With a clear, even light and dimmer to adjust the brightness to suit your project, the LightPad LX comes in any size from the extremely portable 920 to the dream-sized tabletop-friendly 950. These are an indispensable aid for calligraphy, stenciling, tracing, artwork layout and design, quilting, applique, embroidery, tattooing, animation, and more. 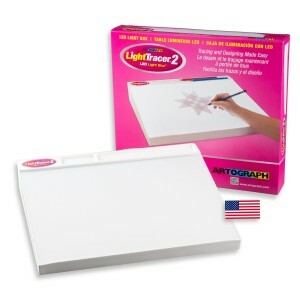 The LightTracer and LightTracer 2 offer a friendly, lightweight light box with a slanted surface which makes it ideal for using on your lap. The LED light is cool and brilliantly bright. This is the budget-friendly choice for all arts and crafts, and makes a wonderful gift to introduce the next generation to artwork, sewing, embroidery, and more. Like all our light boxes, the LightTracer is MADE IN THE USA. Step up to our premium light box with the LightPad PRO 1200 and 1700. These square-shaped light boxes are designed to suit any size or shape in a 12 inch square size, or a jumbo 17 inch square size. Unique to the LightPad PRO is its TEMPERED GLASS CUTTING SURFACE. You can cut directly on the surface with an X-acto knife, razor blade, or rotary cutter. No cutting mat is needed. This gives you unmatched precision in cutting applique pieces, airbrushing masks, or anything else you want cut precisely. The ability of the LightPad PRO to ADJUST COLOR TEMPERATURE from cool white to warm white lets you adjust the color of the light to suit your eyes, or your project. Changing the color temperature can bring out different aspects in your artwork of fabric, making it easier to see the elements you need to see with clarity. The BOOST lighting feature makes the LightPad PRO the most dazzlingly bright light box made. The LightPadPRO is also MADE IN THE USA.